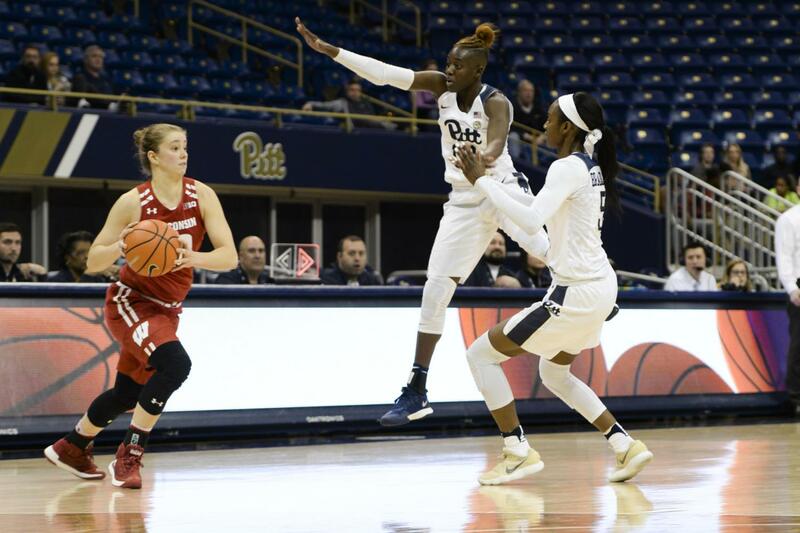 The Pitt women’s basketball team had a last-second chance to win its Wednesday night game against Wisconsin, but when the ball ricocheted off the rim as time expired, it was the Badgers who stood victorious. The team entered Wednesday’s game on a three-game winning streak with its previous loss from a Nov. 16 match against Duquesne. The streak ended with the team’s 58-57 loss to Wisconsin in the annual Big Ten/ACC challenge. The Panthers also lost last year’s close contest to the Purdue Boilermakers, 67-61. Offensively, the Panthers struggled to find their shot to start the game, going just 5-15 from the field in the first quarter. The focus seemed to be on creating open looks at the three as the Panthers shot the ball six times from beyond the arc in the first quarter. Even though Pitt struggled to make its shots, it managed to string together a series of early baskets to claim a 6-2 lead. The Panthers started sluggishly against the Badgers, especially in rebounding. Wisconsin doubled Pitt’s rebound total, 12-6, in the first quarter. Pitt’s strong defense kept the team in the competition and forced Wisconsin to commit seven first-quarter turnovers. The only Panther to hit a 3-point shot was first-year guard Kyla Nelson, who drained a buzzer-beating 3-point shot from the wing to end the first period and cut the Badgers’ lead to 13-12. The Panthers stuck to their shooting ways in the second quarter and it paid off as they shot 5-8 from the arc in the second quarter. Redshirt junior Yacine Diop opened the quarter with a free throw to tie up the game. After two baskets from the Badgers, Pitt’s first-year guard Pika Rodriguez squared up at the arc for a 3-point shot. Wisconsin had more success with shooting and continued to stretch its lead, going on a 7-0 run. Nelson halted the run when she nailed a 3-point shot to make the game 24-20 with 3:27 remaining. Both teams continued to find shooting success in the final minutes of the half. Nelson led the Panthers with nine points at the half, scoring all of her points from the three to go 3-3. Despite Pitt’s hot shooting, though, Wisconsin held the lead at the half 31-29. Entering the game, Nelson was shooting only 28 percent from the three. She said her teammates helped her find her confidence against Wisconsin. The Badgers’ first-half performance helped them lead the Panthers in rebounding, 24-10. Junior forward Marsha Howard was the star for Wisconsin, putting up eight points and eight rebounds in the first half and shooting 4-5 to start the game. Both teams traded baskets to start the second half with the Panthers taking a 33-31 lead nearly two minutes in with a jumper from Diop. The lead was Pitt’s first since it held a 6-4 lead with 4:07 left in the first quarter. Diop became Pitt’s spark plug in the third quarter after shooting 0-5 in the first half. She started well, scoring the team’s first four points. In total, Diop had 11 points in the quarter, shooting 4-4 from the field and 1-2 from the free throw line. Diop attributed her strong second half to a more relaxed approach to the game. Diop’s scoring was not enough, though, as the Badgers seized control of the game in the third quarter. After Pitt took its lead with 8:06 remaining, Wisconsin went on a 22-10 run to close the quarter. The Badgers led by a score of 53-43 at the end of the third. The Panthers were locked in on defense to start the final period, forcing the Badgers to commit four turnovers in the first five minutes of the quarter. Pitt junior center Kalista Walters ignited the Panthers’ defense with two huge blocks to start the fourth. Walters almost sent the ball into the first row with a ferocious block on Wisconsin senior guard Cayla McMorris with 6:04 remaining. The defense led to offense as the Panthers went on a 12-2 run to start the fourth, tying the game at 55 with a 3-point shot from the wing from Rodriguez with 4:36 left in the game. After trading the lead twice more, Panthers trailed the Badgers 58-57 when they forced the Badgers into a shot clock violation, getting the ball back with 15.4 seconds remaining. After two fouls on two separate inbounds plays the Panthers finally got a shot off from sophomore guard Jasmine Whitney. The shot clanged off of the rim and time expired. Wisconsin walked away with the 58-57 victory. The Panthers travel to Bronx, New York, Sunday, Dec. 3, to play the Fordham Rams with tipoff set for 2 p.m.